A Wedgwood, dark blue jasper dip bud vase. This piece is marked 'WEDGWOOD ENGLAND' and it dates from c.1900. It also has an impressed letter 'A'. It is the perfect size for a small posy of flowers or a single stem. It is decorated with three different classical scenes which are divided by anthemions. To the neck is a narrow band of oak leaves and acorns. 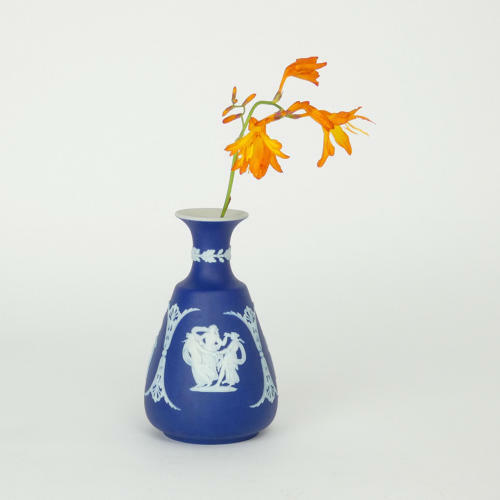 The reliefs are all good quality, the jasper dip is a good, rich shade of blue, and the vase is in excellent condition.